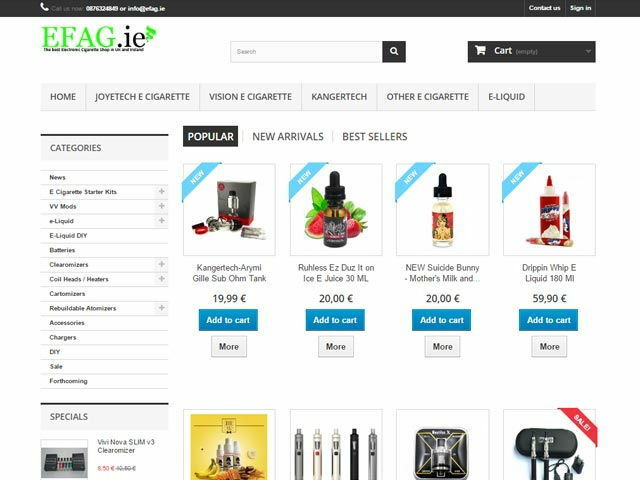 Find the best deals & service online with the most comprehensive directory of ecig & vape stores based in Ireland. 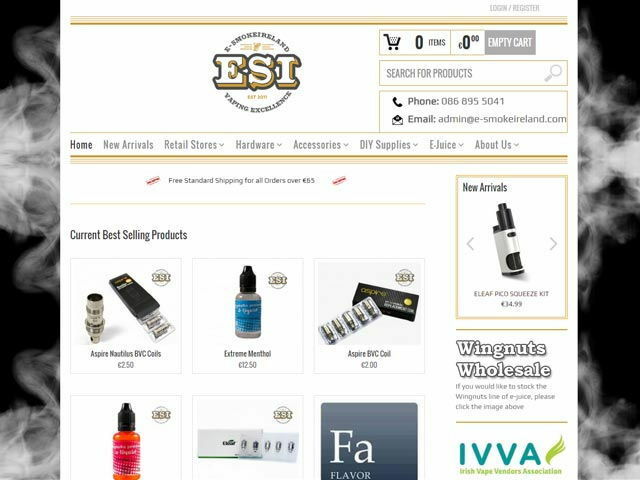 From ecig starter kits to advanced rebuildables, you'll find everything you need right here, each ecig/vape shop listed below is tagged and categorised based on the products they sell making it easier to find what you want! We are a relatively young company on the Irish market, although we work with an existing company in the European market for many years. 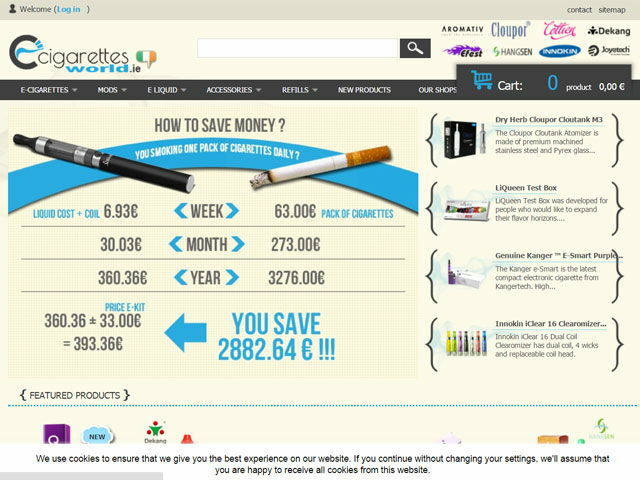 E Cigarettes World was established in 2012 and is based in Sligo. The thing that makes us unique in the European market is the high quality and the excellent performance of our eliquids brands such as Dekang, Hangsen, LiQueen, Mild, Provog, P1 and Aromative. 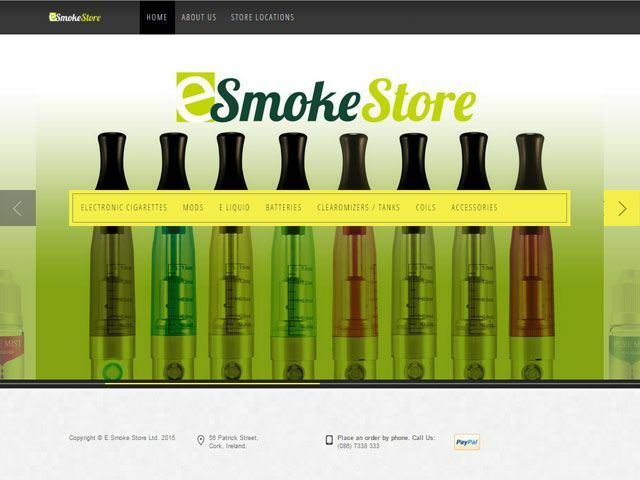 E Smoke Store is an Irish company from Cork City, Ireland. If you are starting down the road to a Smoke Free life then we are here to help you quit. Our friendly and informed staff will help you in store to decide what electronic unit and e-liquid you require to start vaping. We Only stock Genuine Products which we source directly from the Manufacturer assuring us the best quality is being Maintained at all times. All Our kits come with a free bottle of EU Manufactured Liquid to get you started. 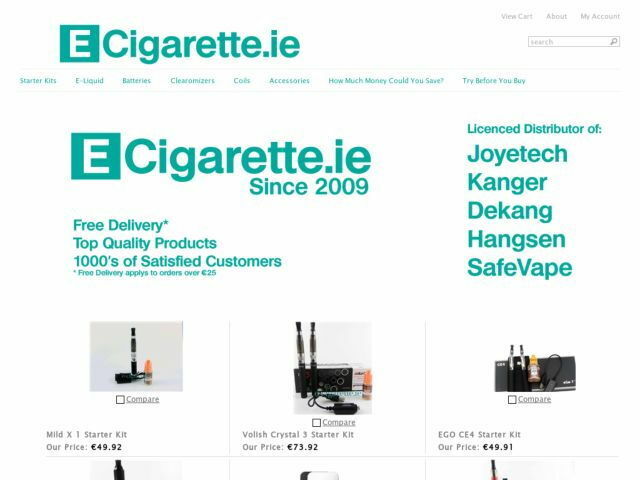 E-CIGARETTE.IE are an Irish Company. We have been selling quality Electronic Cigarettes Since 2009. During this time, through customer feedback and from our own experiences with different products, we have learned whats good and whats not so good.One of Ireland's very first E-Cigarette Companies.Visit us at our Wicklow Town Superstore or check on our website for a store near you. 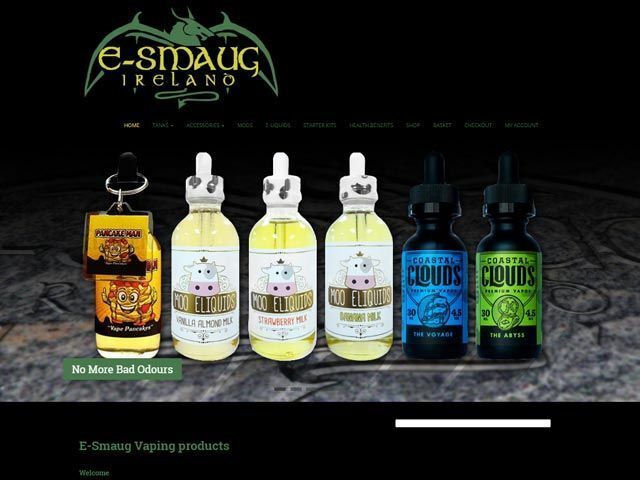 E-Smaug Ireland have searched the globe far and wide to find the best quality premium Vaping products for all your needs. We aim to be the first with the latest products along with product enhancements and accessories. The best thing about our products is you know your getting quality and you wont have to wait a long time for delivery as we stock items locally here in Ireland. We are two ex-smokers in Dublin who's lives have been changed by using electronic cigarettes. Our mission is to help others give up the 'analogue's' while providing the best product range and customer service available. 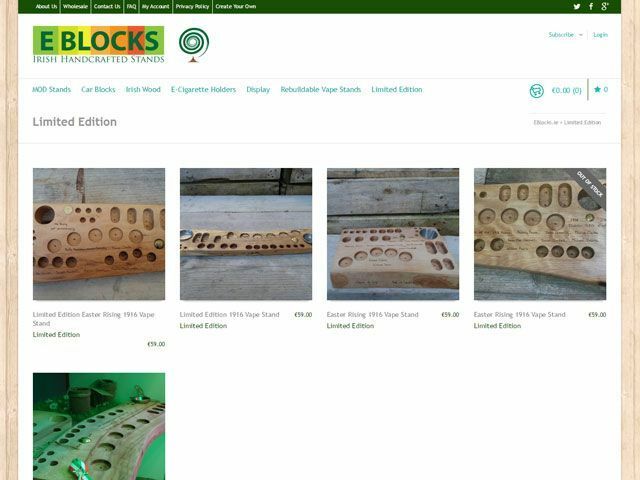 Eblocks are Irish Handcrafted Vape Stands, for electronic cigarettes, e-liquids, Mods and atomizers. Eblocks are crafted, designed and inspired by the picturesque valleys of the Garden County of Ireland. We here at Eblocks have created stands & holders to suit all vapers needs, Eblocks for the car, home, workplace and shop outlets. We have carefully selected good quality timber from Irish timber suppliers to deliver great quality Eblocks, so our products stand the test of time. We use Oak, Walnut, Ash, teak, Iroko, Sappelle and Mahogany for our Vape Stands. e-CigShop are young, enthusiastic and customer oriented team with 4 years vaping experience. We initially started as online business but now have opened our first shop in Limerick city center. We are driven to provide our customers only the best products out there. Therefore we test all of them ourselves before offering to our customers. We are a multinational and multilingual team providing customer service in English, German, Polish, Russian, Ukrainian and Latvian. So feel free to get in touch with us in your own language if you like. 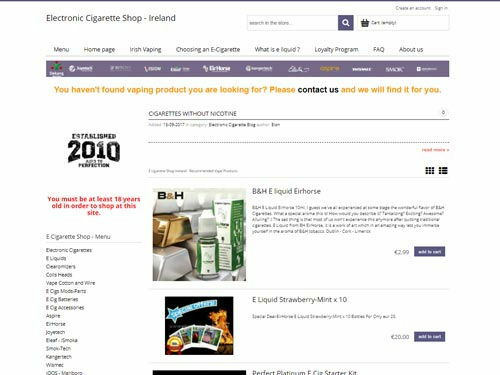 Ireland’s Most Trusted Source For Electronic Cigarette Products Since 2009 We stock all the leading brands at Ireland’s lowest prices and offer Free Delivery on ALL orders (including Free Next Day Registered Courier for all orders over E50). 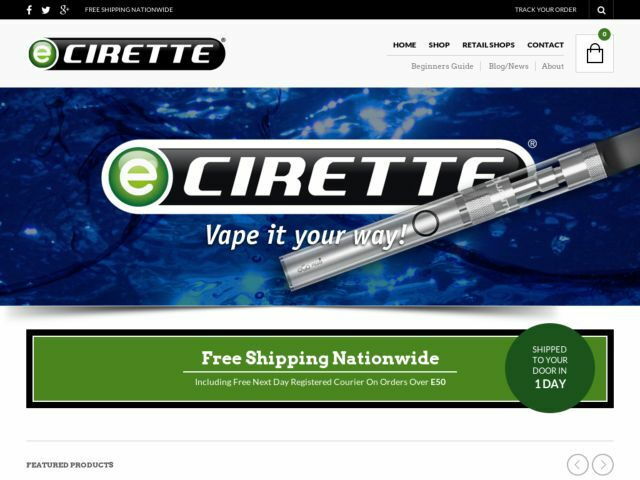 Ecirette accepts all major Irish Credit Cards and PayPal payments. We also have two major retail outlets in Dublin City and supply countless other retailers across the country. Efag.ie is known for its high quality, low prices, convenience, and outstanding service. Our team Our team has extensive experience in product and brand development, manufacturing, and have been in the smoking industry for years. We, personally, tried and tested each and every product before offering them to you. We are obligated to bring you only the BEST!!! E-Cigarette-Ireland is known for its exceptionally high quality products at affordable prices, outstanding customer service, and user friendly ordering process.